This machine is used for folding the 3 side edge of PVC or PET blister for folding card. Before the blister folding on this machine, it should be formed the shape by thermoforming machine, and cut to the suitable size for folding. 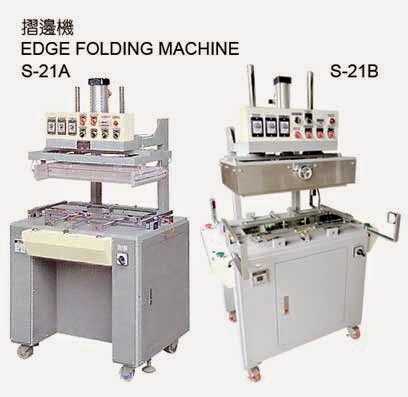 This machine is only action for folding the 3 side edge job. When the long of blister is small than 295 mm, we could load 2 pcs of blister on this machine to fold at the same time. When the long of blister is beyond 295mm, we could only load one pcs of blister to folding. Our heater design four heaters on the four sides. When face this situation, we could turn off one side of heater to save power energy consumption. Some blister only need to fold two sides, our machine could turn off the two width side of blister, so that it could only fold two side. The machine model S-21A has only one seat for operator to sit. One operator should load 2 pcs of blister at the same time, and take out 2 pcs of blister at the same time. The S-21B has double seats for two operators. We could select one operator to work on this machine, or two operators to work on this machine. The machine have safety design, it will not action when only one operator to press the start switch, or the operator put their hand inside the folding area. It includes 2 sets of sensors on this machine. Folding The packing blister 3 edge for insert cardboard. 1.Very effective table style design. Safety for operator and ease of operation. 2.High speed. S-21B has double work stations, when blister size long is small then 298 mm it could load 2 pcs blister to folding at the same time. It saves electric power. 3.Safety working, due to double push button to start cycle. 4.High quality components only are used in all circuitry and mechanical parts. We accept the special size order. Sensor for protecting the operator are including with the machine. S-21A one set of sensor. S-21B two set of sensor.